KYZYL OI, KYRGYZSTAN — Bishkek was quiet in the morning when I woke up and loaded the UAZ for departure. I had hoped to make an early exit from the urban area after hearing that the main road west out of town tended to get jammed up, however timing was against me. Despite my early start, I had to wait for the bank and the phone store to open before I could leave town. The supermarket was open early enough for me to get my supplies and lots of extra water, as I was unsure of exactly what kind of options I would find en route for buying water and some basic food items. However the two most important tasks of my morning were getting a local sim card (and a cheap phone that I could use it in) and getting enough som to make it to Naryn at a minimum — locally everything would need to be paid for in cash with som rather than euros or dollars. When the bank opened at nine I was first in line, but their computers were slow to warm up and the currentcy exchange took longer than I hoped. Ditto for the process of buying a phone and local sim — which was made a bit more complicated by the lack of common language, though the people at the phone sellers were very helpful in trying to find someone who could help us communicate and eventually I succeeded in getting a basic phone with two sim cards — one for each main local carrier. I didn’t realize that was important at the moment, but would come to understand it later. With cash and communications in hand I could finally head out of the city. My original plan to first go east to visit the Burana Tower, a touristic site that contains the remains of an old minaret as well as some ancient burial markers, was no longer an option. The morning tasks had taken too long. I would have to leave directly for the west and the Parmir Highway to Kyzyl Oi, the village I would be spending the night in. I was excited and glad to finally be “on the road” as I made my way westward on Chuy Avenue, a major thoroughfare that was packed with vehicles winding their way across non-existant lanes. The stop and go traffic was typical for a chaotic urban environment, but the more dangerous aspect of the drive were the cross walks and police positioned behind them. The local law is that traffic must stop if anyone enters the crosswalk, regardless of how far across the six lanes of traffic they are from your vehicle. And the local police make it a practice to pull people over for driving thru even if someone just steps off the sidewalk from the otherside of the street as you are pulling through. Needless to say I had to make a few very quick braking maneuvers, and once almost ended up with the guy behind me in my back bumper — but managed to avoid the ticket trap, accidents, or pedestrians as I slowly made my way across the city. The first observation besides the traffic was how spread out Bishkek is. It seemed endless as I drove on for what felt like hours. And after just a little while I had my first technology fail. I had set up my InReach device to work with my iPad as a very nice large screen GPS navigational tool to help me get through the urban maze. It worked great initially, until somehow my iPad decided I needed to update my software and started speaking to me in Russian — unable to update the software until I again had wifi I lost my visual position reference with respect to the local streets. Already the fact that all the signs were in Cyrillic had made it confusing. Now without the map screen I was going to have to refer to paper maps with English translations that I couldn’t match up to the Cyrillic road signs while I was driving in this insane traffic that only got worse as I neared the long distance bus and shared taxi stands. The areas near the buses and taxis were a whirlwind of crowds, cars, and chaos as vehicles stopped for no reason and others jutted out into the main traffic from all angles. The crowding reduced six lanes to two, or sometimes only one. I began to think I would never get to the turnoff for the Parmir Highway before day’s end, but I had no time to figure anything out as I had to keep driving forward or be subsumed by the chaos. Eventually I reached the M-41, which is the official designation for the Parmir Highway, and turned southward onto a much calmer tar road. A few trucks were parked along the edges of the road at the turnoff, and I took this opportunity to pull over and get reorganized. From here on I could easily navigate using my paper maps and I breathed a sigh of relief as I set off on my first segment along the legendary road. If I followed it all the way it would take me to Afghanistan. The M41 at first glance seemed a bit of a let-down. I had imagined something more “technical” or at least a bit rougher, but a nicely paved ordinary straight stretch of tar road spread out before me. I eased into the drive, glad to be out of the urban traffic, and eventually saw the silouehttes of mountains on the horizon. Upon reaching the base of the mountains, the road began to curve and there was a little bit of traffic in front of me, but we were still moving at a nice pace. And then we were stopped. A large herd of sheep spilled across the road and surrounded a tractor trailer, freezing it in place. 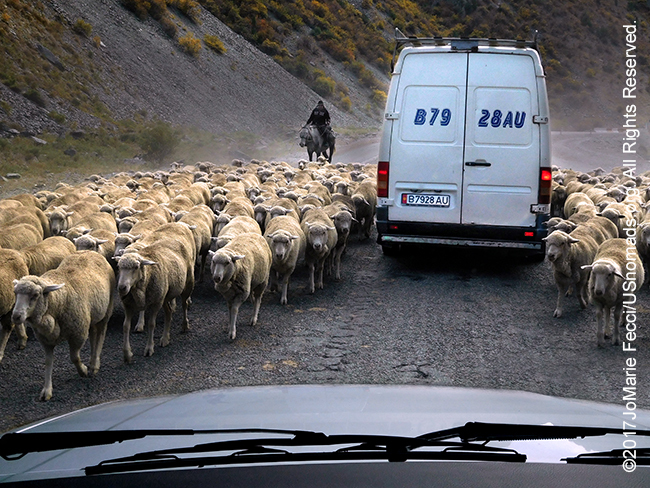 The sheep swarmed around a Marshrutka in front of me, then swarmed around me as well. The sea of sheep were being driven by a single shepherd who seemed to take his time moving them passed the traffic. The standstill lasted a few minutes as the herd made its way down the highway, and then we began to move forward as the last few sheep scampered off to join the rest. Not long after, we were stopping again, this time for a herd of horses that made for a beautiful photograph as they trotted along the highway overtaking the trucks coming from either direction. Motorized traffic halted and the animals were given the right of way. This process would repeat several times during the drive up the mountain, as it was the season when herders were bringing their animals down from the high elevation summer pastures to their winter pastures on the other side of the mountains. There was even a period when the road was entirely shut to vehicles in an effort to get the herds down in a more orderly fashion. The orchestrated movement of vast herds of livestock proved chaotic nonetheless, and the image of massive tractor trailers stopped dead in their tracks by sheep was somewhat incongruous but somehow perfectly indicative of the modern contradictions here in Kyrgyzstan. After the animals came the steep switchbacks, where many trucks and cars that couldn’t make it were pulled over along the sides, hoods open, sometimes with someone under the vehicle and in various stages of repair. I got a lot of practice using my gears to climb at the optimal rate, but had to be careful of the large slow overladen trucks chugging ahead of me. While this whole segment of the drive was still on pavement, some of the rules of offroad were very top of mind. Notably to make sure the guy ahead of me can clear the hill before starting up the next segment. It was slow going to reach the top. As we got higher up there were a series of “tunnels” — at first just kind of covered roadway sections that resemmbeled something i had seen in the Sierra Nevadas where a railroad track was covered in a similar fashion to protect it from snow. I guessed that these tunnels served the same kind of purpose. They were fairly narrow, but two vehicles could pass each other, and they were open on the sides so there was light. We were almost at the very top now, and I could look down from where we had come up and see the winding road disappearing down into the folds between the mountains. Across the way I could see snow between the peaks. There was a real feeling of being on top of the world, in a very literal sense. After a short pause I continued on, assuming that we would begin the descent but first there was one more tunnel. This was a real tunnel. Cutting through the very core of the mountain. I followed the vehicle ahead of me into the blackness, assuming that it would be an ordinary tunnel like so many I have driven through in a lifetime. But it wasn’t. It was very very narrow, but still wide enough for two vehicles to pass, though there were no lights apart from the vehicle headlights, and as we drove deeper into the tunnel it became pitch black as there was no light behind and no light in front. It was very hard to know where the side of the wall was, and so when I had to pass another vehicle, especially a large truck, I moved very slowly. The darkness continued for a long time and I wondered how far the tunnel would go before we would exit. It seemed incredibly long before I was able to see a hint of light ahead, indicating the exit. When I finally came out into daylight, I felt a real sigh of relief. I was finally on the other side, and now I could look out over the Suusamyr valley stretching out below. The valley looked warm and gentle and safe compared to the rugged mountains I had just crossed. The golden color of the autumn grass gave it a glow in the afternoon light and I felt drawn to it. I was glad when my route turned away from the harsh mountains of the Parmir Highway and down into the golden glow. Down in the valley I turned onto dirt heading south towards the Suusamyr River. The golden hills rose up on either side of the flat prairie and horses and cows grazed peacefully in small groups dotting the landscape. A few riders could be seen in the distance and I was now the only vehicle on the road. The small villages along the way were really just a gathering of farmhouses in the vast openness of the valley. On the outskirts of Kojomkul the strange memorial yurt stood alone slightly askew. I stopped to explore and take a few photos before continuing on into the next set of mountains just beyond the village. The sun was getting low in the sky, but I wasn’t far from my destination for the night, and I stopped for a few more photos along the river that where it ran between the two mountains. The rivers here ran pretty rapidly, and I remember reading that it was possible to kayak here, but looking at the fast moving water glistening in the shadow of the mountain I was doubtful. And in any case I don’t have a kayak with me. I continued the route to Kyzyl Oi, moving a bit faster now to make up some time, and it wasn’t long before the mountains opened up onto a calm protected village hidden between the folds.